Since Memorial Day is the unofficial start to summer, I started to think about all my favorite nail polishes for this time of the year. I kind of scrolled through my blog a little to rediscover what I loved last year. Not that I am out of manicure inspiration, but I felt like a walk down memory lane. That is one positive thing about my blog and tumblr, I can look back to see how I’ve grown with my tastes in polish. When I first started wearing nail polish I wore a ton of dark polishes and wouldn’t buy a pink or red to save my life. Now I’m staring at my fingers and chuckling that I’m currently wearing pink. But as I scrolled through my tumblr from last summer, this manicure hit me. I wore this manicure probably 10 times last summer! 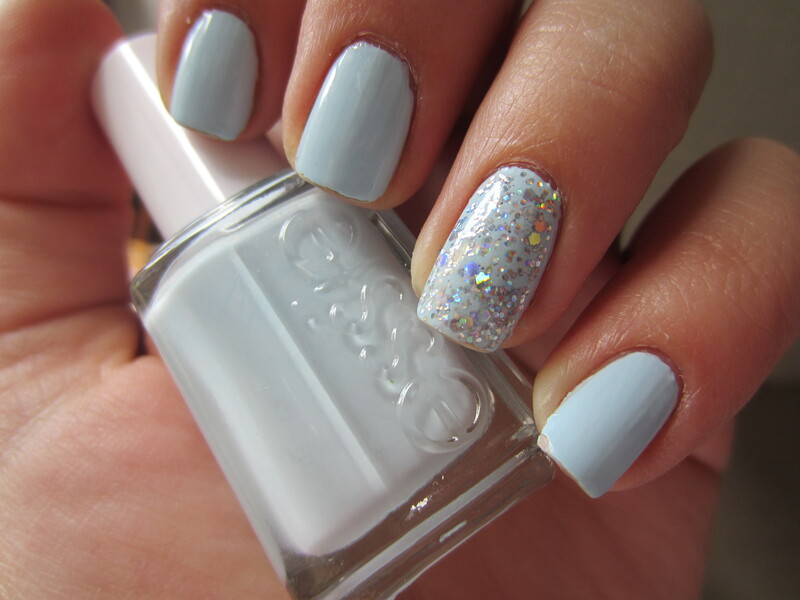 I was obsessed with Essie “Borrowed and Blue” last summer. While I’m a huge fan of any baby blue, Borrowed and Blue is by far my all time favorite. It is the perfect baby blue with a very strong white base. It is opaque in 2 coats and just jumps off your nails. Its so stark and crisp with the opaque white base and I can’t understand how I ever stopped wearing it. I fell in love with this polish all over again and it seriously is my all time favorite baby blue. This is a must have for any nail polish lover because its one of the easiest Essie polishes to work with and the color is beautiful on all skin tones (especially darker skin tones because it jumps off your hands even more). And then I added Icings “Frost Yourself.” Remember How to Lose a Guy in 10 Days? Thats definitely where this polish got its name, since it really does look like a diamond on your finger. Its the best disco ball chunky glitter I’ve ever found because its really dense in just 1 coat. And since I don’t have a real diamond on that finger yet to frost myself, this polish will definitely make do for a while. I remembered how much I loved these two polishes! Perfect in the summer sun. Oooo pretty! Is borrowed and blue one of Essie’s core polishes?